On January 3, 2017, El Paso, Texas and Ciudad Juarez, Mexico-based AGENCY Architecture took advantage of the selfie phenomenon, transforming a public park with a temporary installation and data privacy experiment dubbed the SELFIE WALL. AGENCY describes its practice as engaging contemporary culture through architecture, urbanism, and advocacy. By uncovering whether photo data remains private, SELFIE WALL aims to address concerns about how personal selfie culture really is. Thanks to metadata, a picture may really be worth a thousand words. According to AGENCY, selfies are a resource for third-party data-crunchers who use facial and pattern recognition software to extract identity and mood. Metadata is embedded in the photo file, social network post protocols, mobile device settings, and user-generated content, jeopardizing every selfie-taker’s individual data privacy. 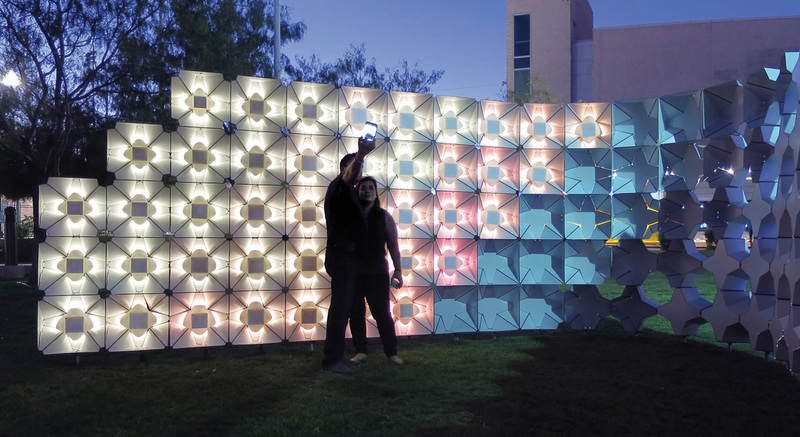 Located in El Paso/Ciudad Juarez (what AGENCY calls a “binational metropolitan region”), SELFIE WALL provided the ideal lighting and visual interest (a perfect selfie stage) to explore these issues. 162 custom-fabricated units and CNC-milled composite aluminum panels were folded to become surfaces for bouncing, scattering, and collecting light. Its rigid, multifaceted structure mimics stage lighting and the photo umbrellas used in portrait photography, film, and vanities. SELFIE WALL allowed for different lighting conditions for day and night, with LED lights providing different color temperatures for nighttime self-portraits. AGENCY is following up the installation, analyzing metadata from SELFIE WALL selfies uploaded to Twitter and Instagram that have an event-specific hashtag.